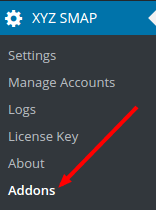 Please go to the “Addons” page by clicking the addon link in the menu. After the installation, click on the “Activate” link. The addon is now ready to use. If you cannot do the automatic installation, please do the following. Download the addon from the XYZScripts Member Area. Now you can see the addon in the installed addons section and you can activate it. If there is any issue, please contact our support desk.